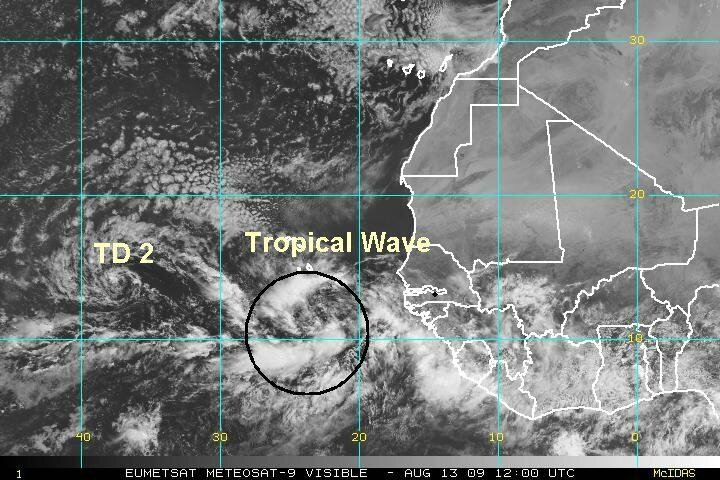 This is the tropical wave that the tropical weather forecast models have been eying for several days now. There is a great deal of convection with it. Models have been very bullish with this system making it a hurricane down the road. Early estimates take it near the northern Antilles early to mid next week. We are watching this situation very closely. A lot of folks will want to know how strong and exactly when it will hit. It is still about a week out from the Lesser Antilles. A lot can happen by then. Sit tight and wait a few more days to see if model trends continue or shift around. The strong tropical wave has lost a lot of convection over the last several hours. Outflow aloft still looks impressive and we expect this wave to re intensify. 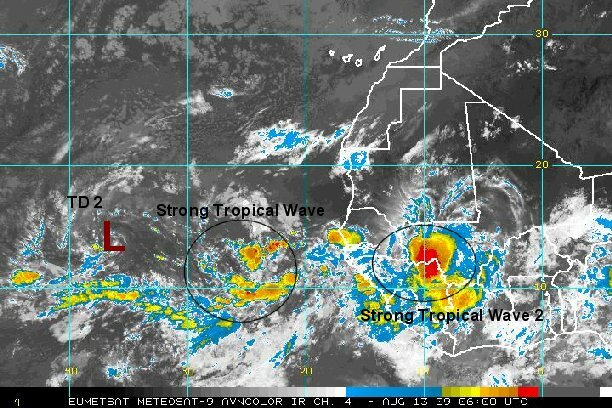 As of 9:30 pm edt / ast the wave was centered near 12.5° N / 22.0° W or about 215 miles south of the southern most Cape Verde Islands. 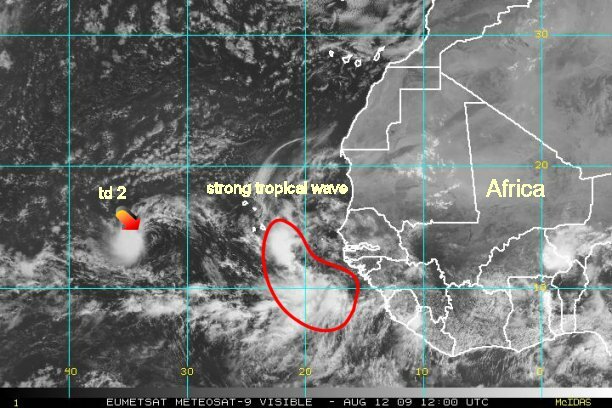 The strong tropical wave has regained some of its convection, but it still remains disorganized. Outflow aloft still favors development. 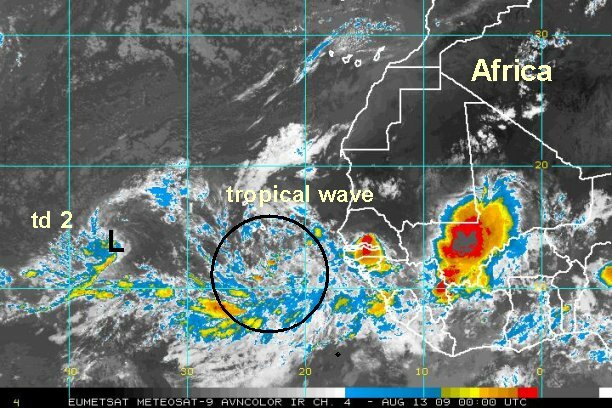 As of 6:00 am edt / ast the wave was centered near 12.5° N / 25.0° W or a few hundred miles south of the southern most Cape Verde Islands. We are watching this situation very closely. A lot of folks will want to know how strong and exactly when it will hit. It is still about a week out from the Lesser Antilles. A lot can happen by then. Sit tight and wait a few more days to see if model trends continue or shift around..... The models have been jumping around a lot recently. We will post more on the models by this evening. 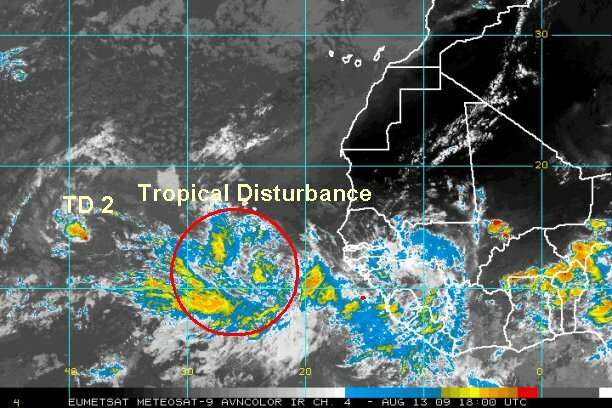 The tropical disturbance that is centered south of the Cape Verde Islands is steadily gaining a better structure appearance. There is a good chance of this becoming a tropical depression in the next 24-36 hours at this rate. We are watching this situation very closely. A lot of folks will want to know how strong and exactly when it will hit. It is about six days from being near the Leewards, if it continues on that forecast path. A lot can happen by then. Sit tight and wait a few more days to see if model trends continue or shift around..... The models have been jumping around a lot recently. Models are still very erratic. Some recurve east of the Leewards, others through the northern Antilles mid-late next week. 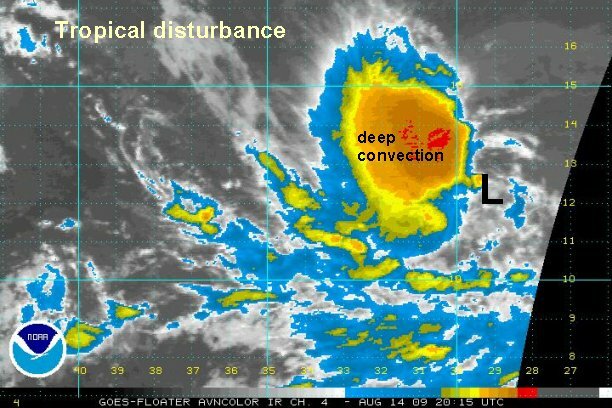 The tropical disturbance is now organizing with a deep ball of convection. 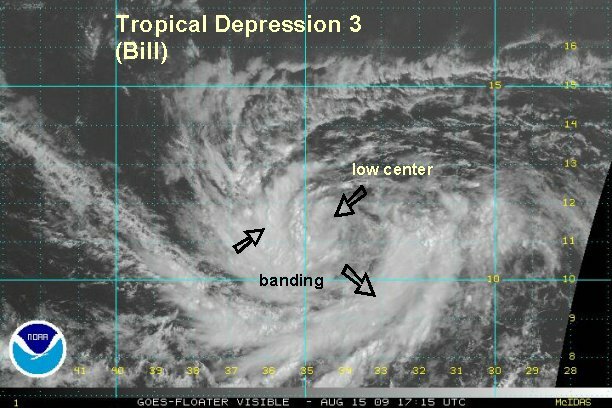 We believe that this is now tropical depression 3 and will be classified on the next advisory by the Hurricane Center. We estimate that top sustained winds are 30 mph. It is centered near 12.5° N / 27° W. Movement is west at about 10-15 mph. We are watching this situation very closely. A lot of folks will want to know how strong and exactly when it will hit. It is about five days (next Wednesday) from being near the Leewards, if it continues on that forecast path. A lot can happen by then. Sit tight and wait a few more days to see if model trends continue or shift around..... The models have been jumping around a lot recently. The models are not agreeing at all. Some go through the northern Antilles to the central Gulf, others recurve east well out to sea. They should get a better handle on the situation in a day or two as an actual low seems to now have formed. 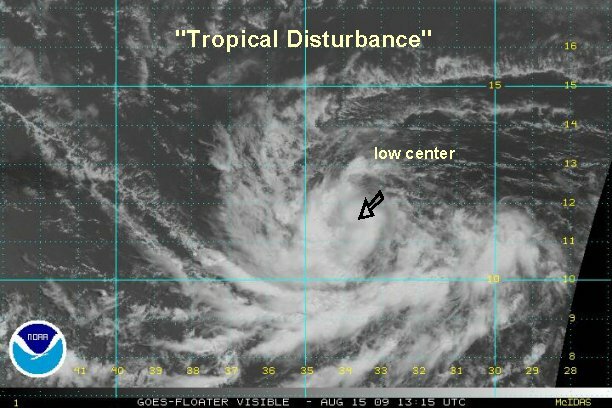 We'll NHC decided to hold off from naming this a tropical depression. Visible satellite imagery shows an elongaed low level circulation with deep convection of the west side. We estimate that top sustained winds are 30 mph. 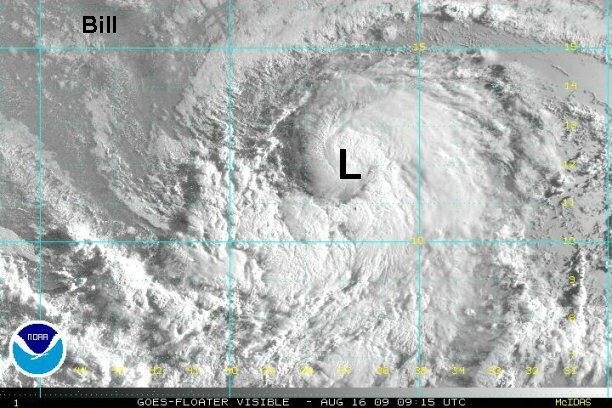 It is centered near 12.5° N / 27° W. Movement is west at about 10-15 mph. The models are not agreeing at all. The latest are still widely apart. We'll have another update this evening on the trends of the models. The convection with the tropical disturbance is increasing steadily on the west side of the circulation. Visible satellite imagery late this afternoon showed the low center still elongated. At 5 pm edt / ast we estimated that top sustained winds are 30 mph in the convection to the west. The east side is still weak with winds estimated at 10 mph. It is centered near 12.0° N / 29.4° W. Movement is west at about 10-15 mph. The models are not agreeing at all. One model is still holding to recurving east of the Leewards and has held to this solution for a few days now. Another model has not bought the weakness in the ridge and is taking the system much farther west. That model is updating with a new run now....more to come later. ****that model run is in and is still holding to a northern antillies / Gulf track. Again the models are about far off as they can get. A new burst of convection is near the surface low. 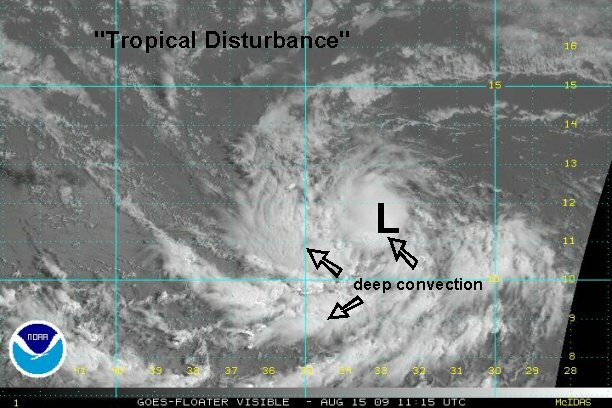 This may finally be the burst that makes NHC classify this as tropical depression 3. In our opinion enough of a surface circulation and convection burst would allow for this minimal classification. TD 3 will probably be announced at 5 am edt / ast since it is not being upgraded at 11 pm edt. 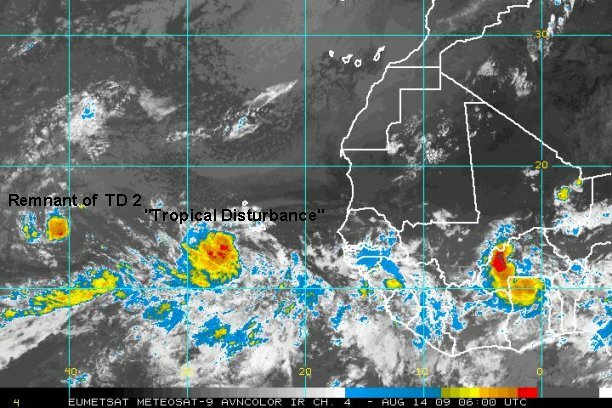 Still not a tropical depression ? 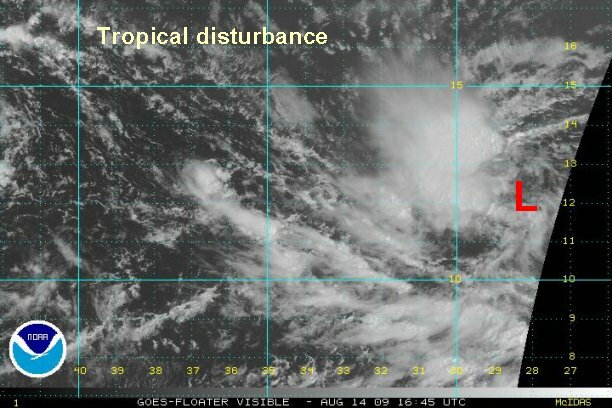 The "tropical disturbance" continues to organize. Not only have we thought that this has been a tropical depression, it is now very close to being tropical storm Bill. As of 7 am edt /ast the depression was centered near 11.5° N / 32.8° W or about 1900 miles east of the leeward Islands. Movement is west at about 16 mph. We estimate top sustained winds of 35 mph with stronger gusts. This system will likely ( should defintely be ) classified as td 3 on the 11 am edt nhc advisory time. We are watching this situation very closely. A lot of folks will want to know how strong and exactly when it will hit. It is about four days (next Wednesday) from being near the Leewards, if it continues on that forecast path. A lot can happen by then. Sit tight and wait a few more days to see if model trends continue or shift around..... The models have been jumping around a lot recently. The models are still disagreeing, although with a farther east trend. One takes it well east of the Leewards, another now recurving just east of the U.S. coast after moving near or just northeast of the Leewards by around Wednesday. This a good trend! Hopefully the models will start aligning with the trend of recurving more. We'll keep you updated with our latest model interpretations as they come in. The "tropical disturbance" will likely be classified as TD 3 or tropical storm Bill at 11 am edt. Visible satellite imagery now clearly shows the surface center. Deep convection is now just starting to build around the center of circulation, as convection to the south continues. It is centered near 11.6° N / 33.8° W or about 1855 miles east of the Leeward Islands. Movement is west at about 16 mph. We estimate top sustained winds of 40 mph (thus making this a minimal tropical storm). This system will likely ( should defintely be ) classified as td 3 / tropical storm Bill on the 11 am edt nhc advisory time. The models are still disagreeing, although with a farther east trend. One takes it well east of the Leewards, another now recurving just east of the U.S. coast after moving near or just northeast of the Leewards by around Wednesday. This a good trend! Hopefully the models will start aligning with the trend of recurving more. We'll keep you updated with our latest model interpretations as they come in. We'll have an update on the models early this afternoon. TD 3 is centered near 11.6° N / 34.5° W or about 1810 miles east of the Leeward Islands. Movement is west at about 16 mph. We estimate top sustained winds of 45 mph ( minimal tropical storm ). This system should be upgraded to Bill on the 5 pm advisory. We are watching this situation very closely. A lot of folks will want to know how strong and exactly when it will hit. It is about four days (next Wednesday) from being near the Leewards, if it continues on that forecast path. A lot can happen by then. Sit tight and wait a few more days to see if model trends continue or shift around. The models are coming together a bit, at least in regard to the path near the Caribbean. The tracks are just northeast or well northeast of the Leewards. All models strengthen (Bill) and make it a significant hurricane. We'll keep you updated with our latest model interpretations as they come in. Bill continues to slowly organize with most of the deep convection on the southern semi circle. Conditions are favorable for further strengthening. 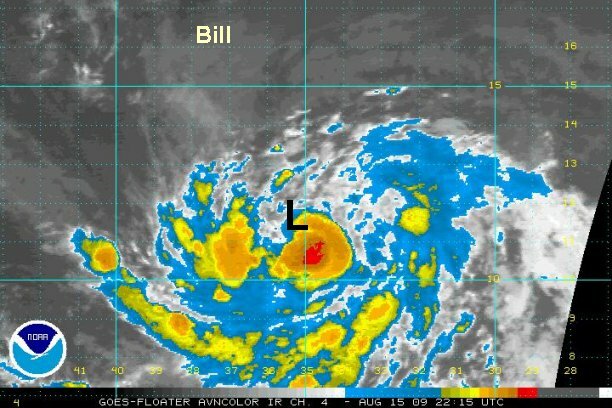 At 8:30 pm edt / ast Bill was centered near 11.6° N / 34.5° W or about 1760 miles east of the Leeward Islands. Movement is west at about 16 mph. We estimate top sustained winds of 45 mph. The models continue to be a bit closer. Right now Bill should be near or northeast of the Leewards by Wednesday the 19th. From there the models diverge. Some take it well northeast, others now recurve it also east of the U.S. coastline. All models strengthen (Bill) and make it a significant hurricane. Nothing dramatic happened with Bill overnight, except for a little more organization and strength. Let's get to the models first though. Forecast models are coming into better agreement over the past 12-24 hours. They are recurving Bill northeast of the Leewards and east of the U.S. east coast. We still expect bill to become a hurricane which can send some swell into the eastern and northern Caribbean islands as it passes by. Depending on how close Bill gets to the Leewards by midweek, some squall are still possible.....to early to tell yet. Of course we'll watch the track for our friends in Bermuda as Bill looks to recurve. That's still a long ways away yet though.